Hello from the future! By the time you read this, it will be Sunday night and I will be in Hollywood, FL for a week-long business trip. Thanks again for letting me contribute to Look What Danny Made! It's been fun watching these few movies "with" you. 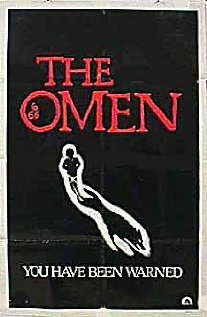 Simply put, The Omen is a bona fide classic. Gregory Peck (yes, THAT Gregory Peck) stars as Robert Thorn, a US diplomat whose wife delivers a still-born baby while they are stationed in Rome. Out of the shadows, a priest appears and offers Thorn another infant, a child who otherwise would have no family (oh, and the child was born on the 6th day of the 6th month at the 6th hour). Knowing his sedated wife would be crushed to learn of her own tragic delivery, he accepts and keeps the secret from her. So the happy couple proceeds to raise the child as their own, however a strange aura of death and danger follows the young boy everywhere he goes. Bad things happen as Thorn digs deeper and unravels the prophetic mystery surrounding his son, Damien. I want to give a plot summary with so much more detail, but I get why you're staying intentionally vague. The movie's over 30 years old, so it's fair game for spoilers, but it still pays to be thoughtful. The Omen haunts me and it only seems to get better with age. Aside from The Exorcist, this is probably the best horror movie to come out of the '70's. Let's start with Peck. He lends such an unusual gravitas to this role, you just know it's not your average fright flick. Directed by Richard Donner (who would next direct Superman: The Movie and later go on to direct The Goonies and the Lethal Weapon series) expertly stages multiple sequences of tension and terror, which build towards a gut punching climax. When I watched An American Werewolf in London last year, I had a few beers and wondered what had ever happened to John Landis. I didn't think of it at the time, but I think the Twilight Zone lawsuit pretty much sidelined him for the better part of a decade. All of that is to say that Richard Donner is a director who worked steadily for over 30 years, and who also knew how to knock it out of the park. In fact, I may even have to say that he's got a better track record than Landis. I haven't seen every last one of his movies, but I've seen almost all of them, and there's really not a stinker in the bunch. I think you nailed most all of the highlights, but I just have to reiterate how very fantastic the scene is where they find out about Damien's mother. Earlier in the film, when the priest was trying to tell Thorn the truth, but is cut off, I was racking my brain trying to think of what the rest of the word could be that he'd been trying to say. Until the reveal, that possibility would never have crossed my mind. Danny, I know you are doing "evil children" week or whatever it is exactly but man, your week should begin and end with The Omen. It only won an Oscar for Best Original Score but for my money, it could've (should've) been taken more seriously in contention for other categories as well, including Picture, Actor, Supporting Actress (Mrs. Baylock) and Screenplay. This is horror done classy and done right. I agree with you on the excellence and deservingness of The Omen, but the project must move on! I've got two more nights of evil children to be frightened by before I head into the homestretch of Return of Project Horror. Thanks for being a part of it, Scott! Five rottweilers out of 5! Agreed. But I'm making them rottweiler puppies, because, awww puppies. "The Omen" is great. You've had a lot of good selections this month.